Today’s Solidarity Thursday blogging topic is “support networks”…which like most things for me, I see through a particularly spiritual lens. This is not to say that this lens is sans practicality. From my perspective spirituality is best when it is practical. It is not just sitting on a cushion or attending Sunday services. Spirituality IS feeding the poor, visiting the prisoner, working for peace, opening our door to our neighbor, and greeting the person working behind the counter with a smile and an open heart. It doesn’t seem to matter much if we can answer the big questions like – Why am I here? Is there life after death? Is there a God?” – if we are unable to feed the hungry next door, or properly take care of the earth, or even find peace in this moment. Perhaps they all go hand in hand. Perhaps as we practice at being kind and compassionate, mindful and awake, patient and open, we discover who we are and why we are here. Perhaps we find God within all of it – the joy and suffering. Perhaps if we are living life so fully in this moment, in love with one another, in love with life, then it doesn’t matter much if there is life after this. Whatever the case, walking this journey together is a gift. No matter how much we want to believe that we are completely self-reliant, that we can conquer and attain anything we set our minds to if we work hard enough…Life, fully and honestly lived, will humble us. We will face illness and loss, we will face death. And in those moments we will realize that having loved ones, family, friends – people who support us and hold us up, who care what we do and how we do it, people who feel our pain and seek our happiness – is a great part of what defines what this life is about. 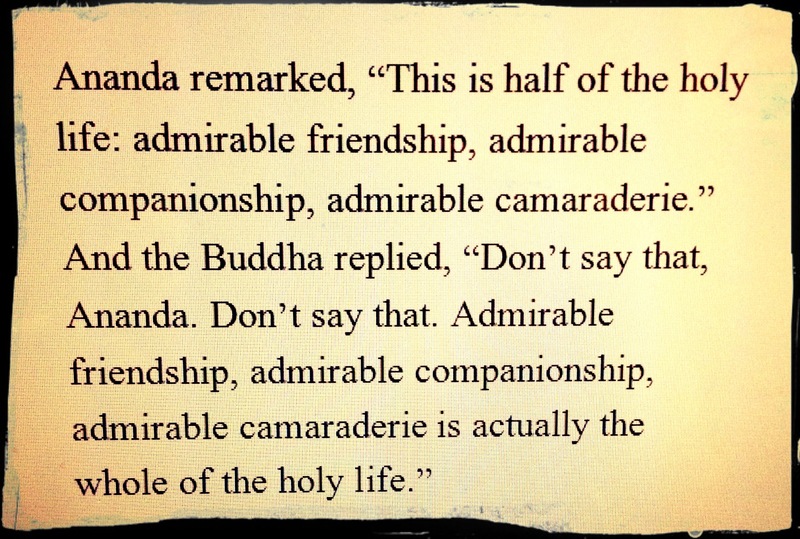 Why is The Buddha so emphatic about this? Why does he correct Ananda with such clarity? Would you argue with Ananda on this point? It seems fair to say that good friendship is a “part” of life. The Buddha in his teachings seems to be pointing toward something greater though – to wholeness, to unity. It is, after all, our perceived separation and deep desire to avoid change that causes us to suffer so greatly. If we see ourselves as separate, then we grasp – we cling – we are unable to let go. Life is letting go…and becoming aware that the nature of life is change, that the nature of life is us. There is no separation. Life is One, expressing Itself in all the beautiful diversity that you see in you, around you. All is gift. For some reason, though, we need to learn this or perhaps re-remember this through first experiencing separation. Life is so often paradoxical. It seems we first need to learn duality and eat from the Tree of Knowledge of good and evil, before we can see through to the deeper unifying Reality, Wholeness that contains light and shadow. It seems we must first leave the Garden before returning to Paradise. We must fall, before we can rise above. We begin life within the body of our mothers. Living as one – eating as one, breathing as one. Doctors say we continue to feel as one with our mothers even after birth. Soon after though, we begin that very difficult journey of becoming aware of being other from our mothers, becoming aware of being separate. The best of religion, the truest of spirituality points us back to our Wholeness with all of Life…not just our mothers. And what is most fascinating and inspiring, is now science is showing us how this is true biologically, chemically, and atomically. All is gift. It is like the Zen proverb says – first we notice the mirror clouded as it is, then we wipe the mirror and wipe the mirror, only to one day realize that there was never a mirror at all. How do we learn this? Where do we learn life? In our relationships. In community. In Sangha. Sangha is the Buddhist term for spiritual community. Isn’t all of this spiritual community? Aren’t we all one Body of Christ? Aren’t we all one expression of Life? I challenge you to find this out for yourself. In this One Body, this One Community, this One Life – we learn patience, we learn humility, we learn grace. In this Sangha, we are broken and our hearts are grown wide and spacious in their capacity to hold and let go in love. In this Body, we are wounded and healed, we die and are reborn. In this Life we don’t become Whole, we become aware that we are already Whole. All is gift. Is there a better “support network” than that? For more reading on this Solidarity Thursday topic, please check out these wonderful blogs: The Horizontalist and Church in the Canyon. And this week, joining us for the first time with a truly unique take on all things Solidarity Thursday is Triskaidekapod. Welcome! My four week old Sadie just started to feel the pain of separation. You just described my whole day today. I think this part right now (around 4 weeks) is the hardest part of having a brand new baby, because you watch this helpless, totally beloved creature start to have pain you can’t fix. She’s realizing that she wants to (or needs to?) learn to soothe herself, and she doesn’t know how. By definition, I can’t help her with that. And that is painful for both of us. Thanks for sweet and joyful reassurance…we are whole.